Today's REVOLVING BOOK is the contemporary western romance KADE ~ Wyoming Brothers Book 1 by by DeANN SMALLWOOD. NEW RELEASE!!! Can she convince him of the truth even though her past is a lie? When the recently incarcerated Hope Jackson knocks on Kade McKune’s door, with three boxes of Girl Scout cookies in her hands, he has no clue his bitter, distrusting rancher’s world is about to be turned upside down. 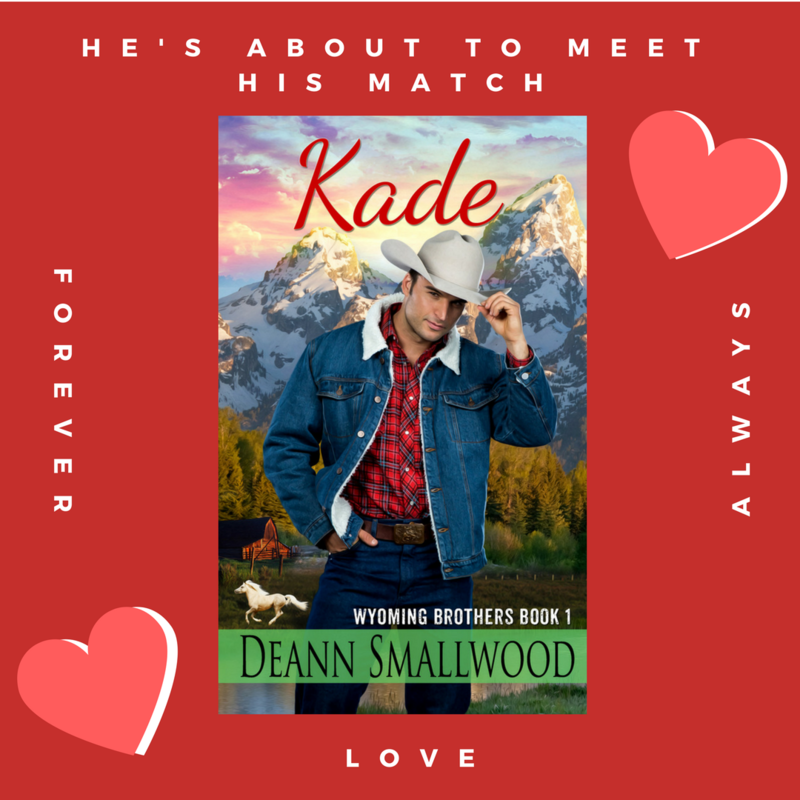 Lied to and taken to the cleaners by a beautiful blonde, Kade has learned a hard lesson and slams the door to any possibility of a woman in his life. Aren’t they all liars? And Hope, with her lie of omission about her background, unknowingly fits that description. Kade isn’t about to give her a chance to win his love and to convince him of her innocence. His beloved Double K ranch is doing just fine with the help of his seventy-eight-year-old Gran—the only woman he can trust. He sure doesn’t need Hope Jackson, a recently returned brother and baby girl, and three abused boys complicating things and resurrecting feelings long dead. I live in Colorado with my husband and my two Yorkie kid dogs: Stormy, four pounds, and Eli, six pounds. I’m a native of Colorado, but I lived for years in Wyoming and Montana. I draw from these three beautiful states for most of my books. My Western Historical Romances are: Montana Star, Sapphire Blue, Unconquerable Callie, Wyoming Heather, One Shingle To Hang, Montana Man, and Montana Rose. Tears In The Wind and Calliope Creek are contemporary westerns. Kade is also a contemporary western and the first book in The Wyoming Brother’s series. I am currently working on the second book in this series: Declan. I branched out and wrote, under the pen name of D. M. Woods, my first suspense/thriller: Death Crosses The Finish Line. The second book in this Death Series is, Death Is A Habit. I will be working on the third book, Death Walks C Dock. I truly mean it when I say my greatest pleasure next to writing is having my books read and enjoyed. There are many more stories just waiting to be written.